Its natural to want to hug and kiss a cute, cuddly bunny. 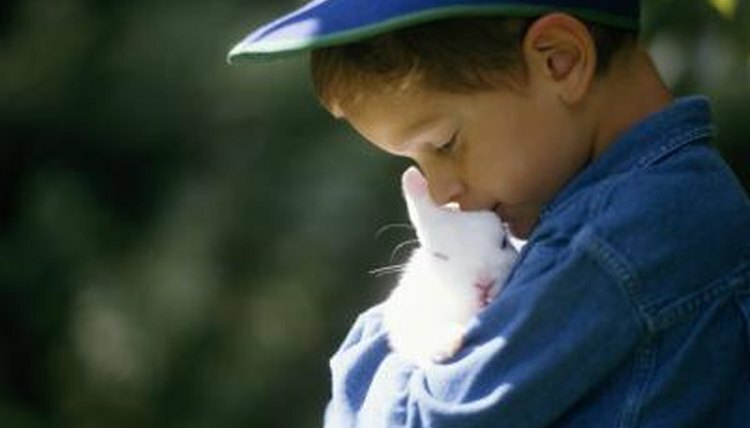 If you are not pregnant or immunocompromised, don't worry too much about catching anything from your rabbit by giving him a quick kiss. Your rabbit's fur or the hay he ate for breakfast is more likely to trigger allergies than you are to get a germ of concern. The reverse may not be true, as a well-meaning kiss from a human can sometimes cause a rabbit's death. Don't kiss your bunny if you have a cold sore, as bunnies are highly susceptible to the herpes simplex virus. In rabbits, the virus sometimes develops into encephalitis, which can develop into a potentially fatal brain infection. Wash your hands before handling your rabbit if you have a cold sore and watch for loss of balance or head tilting in your bunny that can indicate the development of a potentially serious brain inflammation. Don't kiss your rabbit if he appears tense or scared. A nervous bunny may interpret the approach of your mouth as a predatory move and defend himself with a sharp bite or scratch from his claws. A nip or scratch on the nose or lip can be painful, and sometimes require stitches. Wash the bite or scratch with soap or water and contact your doctor's office for advice if the wound is deep enough to draw blood.